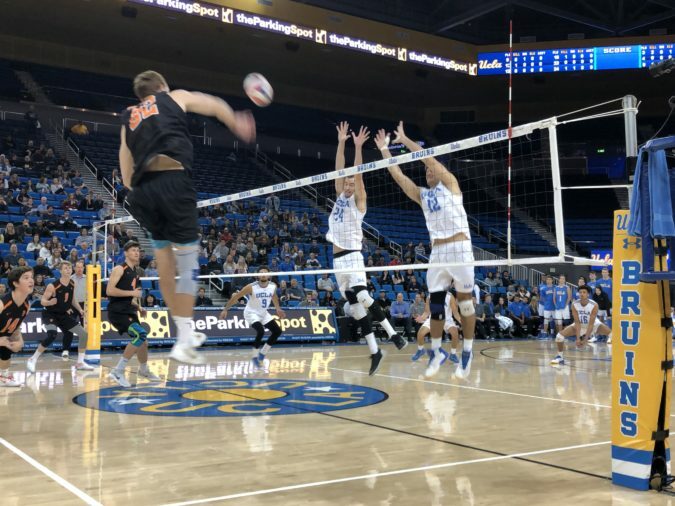 Strong serving and an impressive debut from new UCLA opposite Brandon Rattray led UCLA to a sweep over an upstart Princeton team. Rattray led UCLA with both 15 kills and nine digs on Wednesday. The Bruins had nine aces on the evening, led by middle attacker Daenen Gyimah’s four. The Tigers were led by two players with double-digit kills, including outside attacker Parker Dixon. Check out an in-match interview with former Princeton setter Davis Waddell. Waddell, also known as @emrgencyexit on Twitte, was the first recruit of Princeton coach Sam Shweisky. Also check out an interview conducted by Off the Block special contributor Rae Loverde of Rattray. Finally, check out an interview conducted by Off the Block associate editor Jonathan Bates of Parker Dixon.